The Kate's Clothing team and our development partners have been hard at work, on an updated website for www.katesclothing.co.uk on a new platform. We made the difficult decision to move despite more than 10 years with our previous platform due to high costs, below par customer service and increasing limitations within the software. We made the full switchover on 1st February. The new site has been very well received by our customers and is performing extremely well so for. The new platform will make adaption and expansion infinitely easier and we believe this will be the beginning of a new and exciting journey. Read more about the trials and tribulations in our blog article. Saturday 27th saw the first ever Goths Against Inhumanity Mosh4Life event at the Hammer and Anvil. We raised £138.96 for the Teenage cancer Trust by selling samples and hilarious lucky dips. We'd like to say a massive thank you to the Hammer and Anvil for hosting and to Sarah Jemimah for volunteering to help out the Kate's Clothing team and also to our favourite photographer Vapour Trail Photography for documenting the event. Read the full Mosh4Life story on our blog complete with lots of excellent photos. Keep an eye on our Goths Against Inhumanity page on Facebook for news on our future charity efforts and events or to promote your own. August 2016 - The New Necessary Evil Collection has Landed! The much anticipated new collection from Necessary Evil has finally arrived. This is the first full new collection form Necessary Evil in over a year and it is a timely one, what with the effects of Brexit and the withdrawal of certain other brands from market. The gorgeous new styles stick to Necessary Evil's core principles of timeless, classic, wearable pieces but see them pushing boundaries into the new wave of Dystopian Goth looks, featuring several sheer items which can be layered up. They have also launched an exciting new range of home wares, using their classic prints for duvet sets and tote bags to compliment the existing cushion covers and kitchen sets. We are proud to announce that we have added Lend with Care to the list of charities we support. Lend with Care offer a unique opportunity for donations to be reused. They carefully select and train entrepreneurs in developing countries, we then chose which ones we want our money to be lent to. Once they've received full funding, the entrepreneurs repay the money over an agreed term, which leaves it free to be lent to another. Kate's Clothing have set up the lending group under the name we have given to our charity efforts: Goths Against Inhumanity. Some of the KC staff have already joined to and we were super excited to learn that one of our entrepreneurs, Mukadzi Kushanda has already reached full funding to tile her pre school premises! Find out more at www.lendwithcare.org or why not join our group! Also check out our Goths Against Inhumanity page on Facebook for updates. 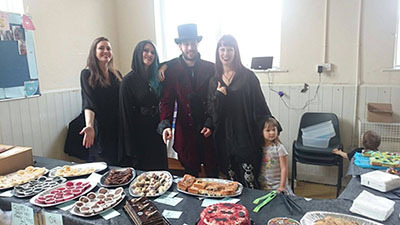 On Sunday 10th July we held our first attempt at Gothic Bake Sale in aid of Shelterbox, read their hilarious press release here. We had great fun, check out how well it went on our blog post or take a speedy look at our 30 second recap on YouTube. Here at Kate's Clothing we've been regularly fund raising or donating to various charities over the years, both as a company and individually, but we recently decided to co-ordinate our collective efforts under the tongue in cheek tag "Goths Against Inhumanity". Anyone can join in with #GothsAgainstHumanity and we'll help promote their efforts and hopefully get them out to a wider audience, bringing together our community and supporting some good causes. So if you're a goth, metaller, rocker or any other sort of vaguely alternative, slightly outside the mainstream person, and you happen to be performing some kind of charity efforts, get in touch, get on the Goths Against Inhumanity page on Facebook, use the #GothsAgainstInhumanity and we'll do our best to help get you out to a wider audience. June 2016 - We have a New Kate! We're extremely excited to welcome Kate Lomax (back) in to the ranks at Kate's Clothing Ltd as Customer Service and Sales Administrator. Being one of the nicest people you could hope to meet, Kate is a natural at customer service and she'll be taking care of our wonderful customers for part of the week from now on. It can get confusing when people ask for 'Kate' now though! For the rest of the working week, Kate goes around being an amazingly talented artist, make up artist and body painter. Check out Kate's amazing artwork on her website. As if that's all not enough, she's also causes mayhem being a Glamazon for the awesome Lucha Britannia. Check out the Lucha Britannia website here. If you're wondering why Kate looks familiar, it's because she's made several appearances as a model on our website and in the Necessary Evil catalogue. She's also helped out at trade shows and generally made herself useful over the years, so we're really pleased to have her officially on board. We are very pleased to announce that Kate's Clothing Ltd is now a Corporate Member of the Bats Conservation Trust. Tackling an issue close to our (dark) hearts, the Bats Conservation trust work tirelessly to secure the future of our bat populations and their environment. Take a look at their website to see all the excellent work they do and see about becoming a member.